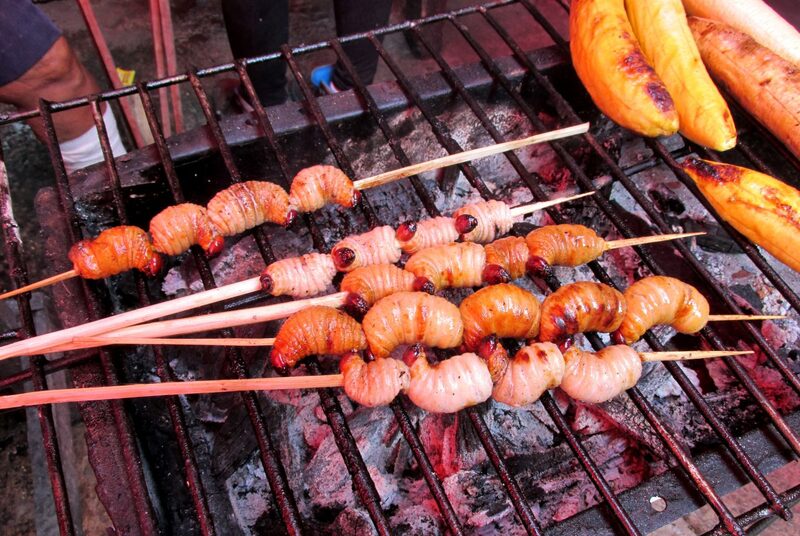 Probably one of the least appealing foods in Peru, suri grubs are fat, wriggly things that should have no business near anyone’s mouth. 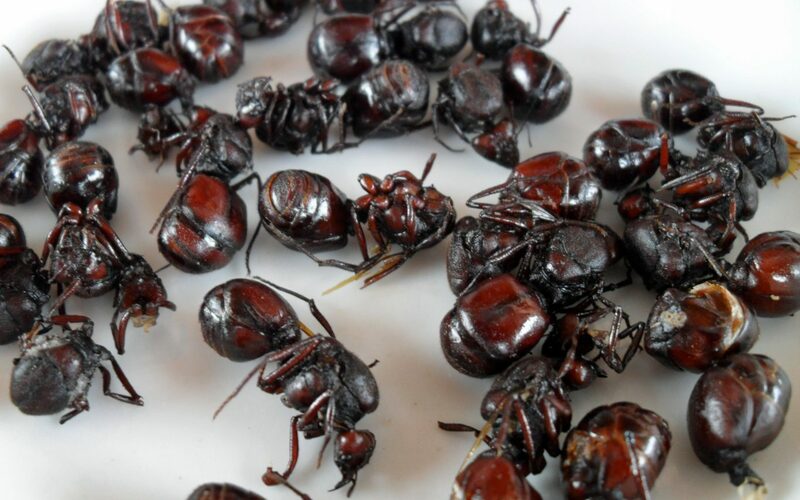 The grubs are the larvae of the South American palm weevil (Rhynchophorus palmarum), known as the cocotero in Peru. Another Amazonian delicacy, you’ll always find them squirming around in buckets in Belen Market in Iquitos. And while you can eat them alive, they are normally stuck on sticks and grilled. If you get one that’s been perfectly cooked — not too much and not too little — it can be quite palatable. Otherwise… well, it’s not a pleasant experience at all. Before you order mondongo because of its fun-sounding name (which is exactly what I did when I first arrived in Peru), ask yourself if you really want a plate of wobbly tripe. This dish of diced cow or pig stomach comes in various forms: as a soup, as a plate of unadorned white lumps, and as the more popular and far more presentable cau cau de mondongo. However it comes, I’ve never had a mondongo that’s given me any pleasure whatsoever. It’s not even that weird, it’s just nasty. The classic meat-on-a-stick staple in Peru, you’ll find anticuchos pretty much everywhere. Chicken anticuchos, beef anticuchos and various other anticuchos are prepared on street-carts and in restaurants known as anticucheras, but the most traditional and most common is the cow heart anticucho. For the offal-averse, cow heart may not be too appealing. But give it a go. 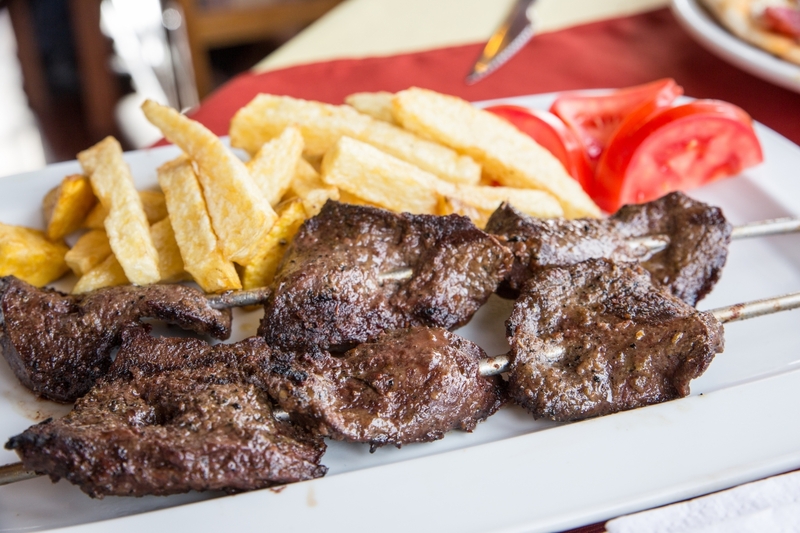 Marinated in vinegar and spices and cooked to perfection, the cow heart anticucho deserves its street-food star status. Paiche is an Amazonian fish that seems perfectly normal while you’re eating it, but gets weirder the more you know about it. Paiche, know scientifically as Arapaima gigas, is a monster of a fish; growing to over 6.5 feet (2 meters) in length, it’s one of the largest freshwater fish in the world. It’s also been around for a long, long time, not changing much from the Miocene epoch (that’s a whopping 5 million years ago). Being an evolutionary old-school wonder, this fish even has to come to the surface to breathe using its lung-like organs. So when you eat paiche — a sublime fish whether roasted, seared, grilled, steamed or in an Amazonian-style ceviche — give it the weird kind of respect it deserves. 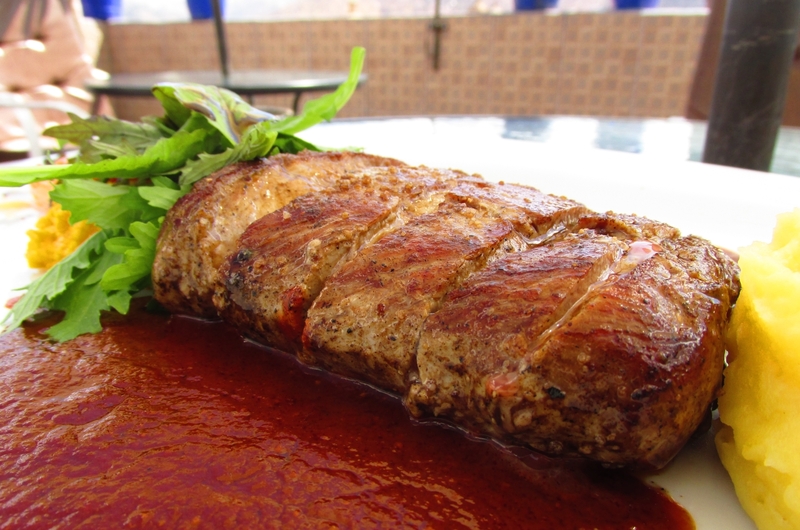 Bull testicles, known as criadillas de toro or criadillas de res, find their way into a handful of Peruvian dishes. Of all the different types of ceviche available in Peru, the strangest is definitely ceviche de criadillas, in which the frozen testicles are sliced and then added to the classic ceviche mix, where they thaw while cooking in lime juice. There’s also sarsa de criadilla (popular in Ayacucho), in which the testicles are boiled, chopped up and added to a mix that might contain beans, corn, onion, peppers, potatoes and vinegar. Enough stuff, at least, to maybe disguise the fact that you’re eating balls. You might already have seen people snacking on chicken feet if you’ve been to China, Indonesia, Thailand, Trinidad and Tobago, Romania, Italy, Jamaica, South Africa, and a few other countries. Apparently people also eat chicken feet in the Southern United States — pickled in vinegar, which sounds extra disgusting. But for the uninitiated in Peru, seeing a street grill covered in little chicken feet can be slightly surprising. I mean, how much meat can a chicken foot provide? The answer is none. It’s all bone, skin and tendon, which is why chicken feet are also found in many Peruvian soups and broths. I always spoon them out and put them as far away as possible, but plenty of Peruvians will happily gnaw away on the collagen-rich clawed appendages. If you’re a jerky fan (they must exist, right? ), then don’t go to Peru without trying traditional llama jerky. 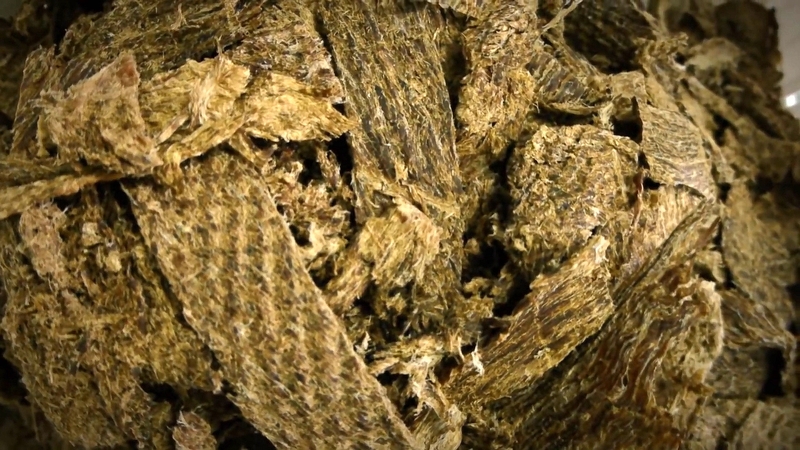 The word “jerky” has its origins in the Quechua word ch’arki, meaning “dried, salted meat,” the salted meat historically being that of the humble llama (one of South America’s indigenous domesticated animals). Make sure you get the good stuff, as less authentic versions are made from beef or — and the package might not tell you this — horse meat. Alpaca is a delicious, lean meat that’s low in cholesterol and low in fat. If you’re walking around Peru taking photos of these pretty camelids and buying textiles made from their soft, soft wool, you might not be thinking “Hmm, I’d love to eat one of those.” Adventurous carnivores would be missing out, however, as alpaca steaks are fine things indeed. As well as being relatively healthy compared to other steaks, they’re also extremely tender with a subtle sweetness. Chicken hearts on a stick? Well, if you’re going to eat something’s feet, you might as well eat its heart too, I guess. Once you get your head around the visual image of tiny little hearts skewered on a stick like some kind of warped Valentine’s Day decoration, then you might actually enjoy an anticucho de corazón de pollo (chicken heart anticucho). Just don’t give it to your girlfriend as some kind of romantic holiday gesture. “What’s for lunch, mommy?” “Chicken blood, my dear!” Yummy. 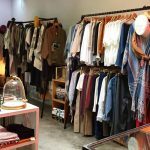 If you’re accustomed to eating blood sausage, black pudding or any other variation of blood-based products, then you won’t have any problems dealing with Peruvian sangrecita. Sangrecita is made from chicken blood mixed with potatoes or yucca and seasoned with garlic, onion, chili pepper and herbs. It’s either served loose on a plate or in sausage form; the sausage variety is sometimes called a morcilla. It’s actually not too bad if it’s well prepared. But if blood ain’t your thing, you’ll probably want to skip it. It’s kind of hard to eat soup when there’s a head in it. 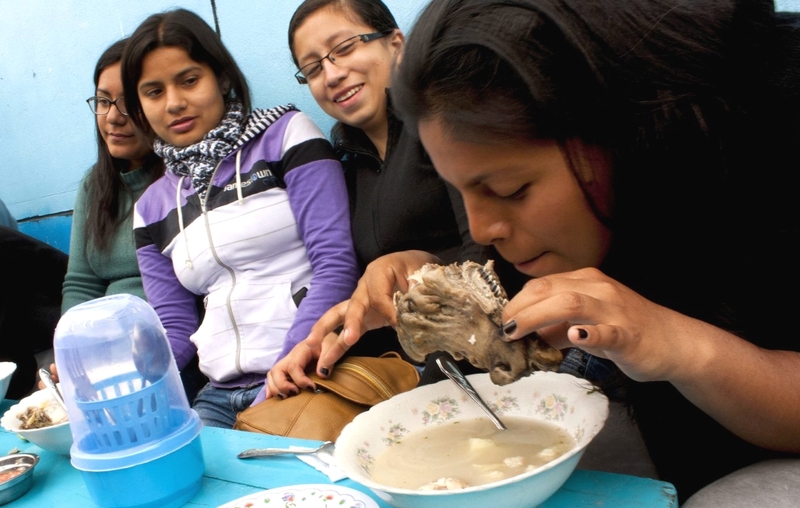 But if you like a nice succulent jaw bone in your broth, you’ll love caldo de cabeza de carnero. Popular in highland regions like Juliaca, Puno, Cusco, Huánuco and Ancash, this goat’s or ram’s head broth is packed with vitamins and minerals, and a few other bits that might slightly diminish the dish’s undeniably excellent nutritional value. It’s an obvious entry, but this list of weird foods in Peru wouldn’t be complete without guinea pigs. Guinea pig, or cuy as it’s known in Peru, is a tough one to swallow if you’ve ever had a guinea pig as a pet. Even if you didn’t, the very sight of a roasted guinea pig can send shivers down your spine. When cooked, guinea pigs tend to have an expression of either a) maniacal joy or b) blood-curdling terror. Either way, it’s not what you want looking back at you while you have your lunch. And guinea pig is often served with the head still on. 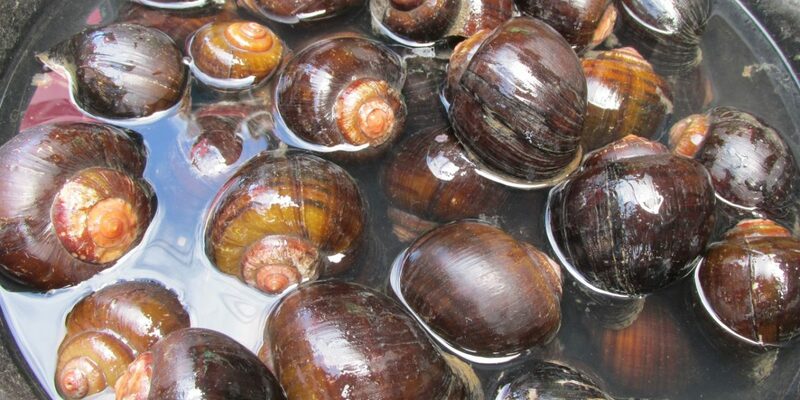 Another jungle delight, giant Amazonian river snails are an important source of protein among indigenous peoples in the Peruvian Amazon, and are also sold in markets in Iquitos and other jungle towns and cities. 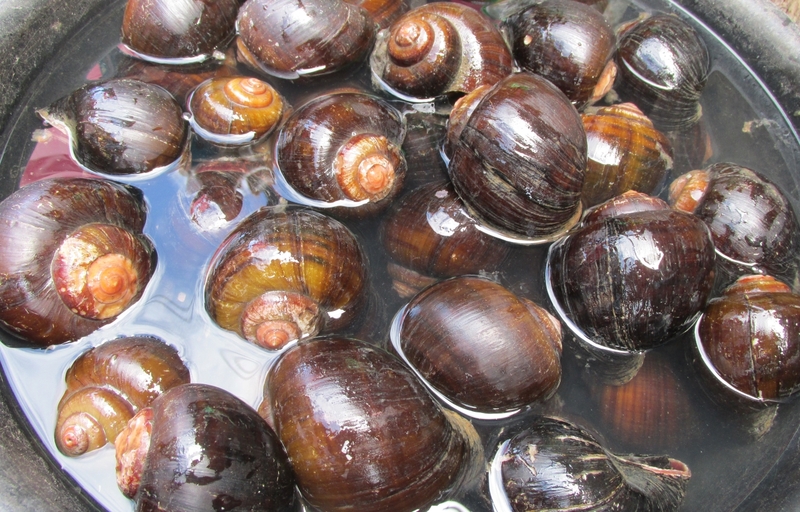 Known locally as churos, the snails are chopped up and thrown into stews with plantain, garlic and salt. Generally speaking, you should avoid any Peruvian dish — or smoothie — that’s made using frogs. Not because they sound revolting, but because the frogs used in these creations might already be on the list of critically endangered species in Peru. About those smoothies: Yep, that’s a real thing. Matrons in markets blend frog flesh into smoothies for their apparent medicinal and performance enhancing benefits. Frogs are eaten in other ways, too, including the critically endangered Titicaca water frog, whose very existence is under threat partly due to human consumption. Best avoided. 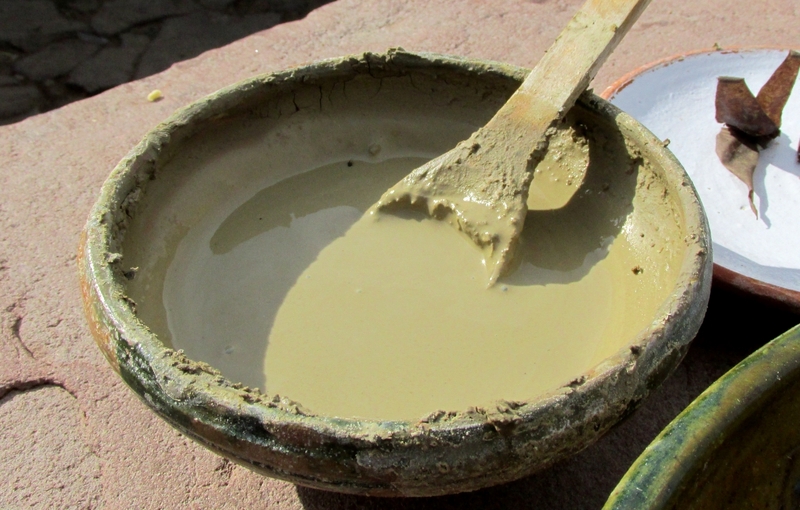 I first came across people eating clay in Peru when I last went to Puno. I was traveling across the windswept altiplano to the archaeological site of Sillustani when we stopped off for some food at a sturdy stone house by the roadside. Here, the family had a spread of potatoes, tubers and cheese, all of which they were dipping into arcilla de chaco, a yellow-brown sauce made from local clay. Apparently it helps with all manner of things, including indigestion and stomach ulcers. You can read more about my encounter with the clay eaters in an article I wrote for VICE. Have You Come Across Other Weird Foods in Peru? 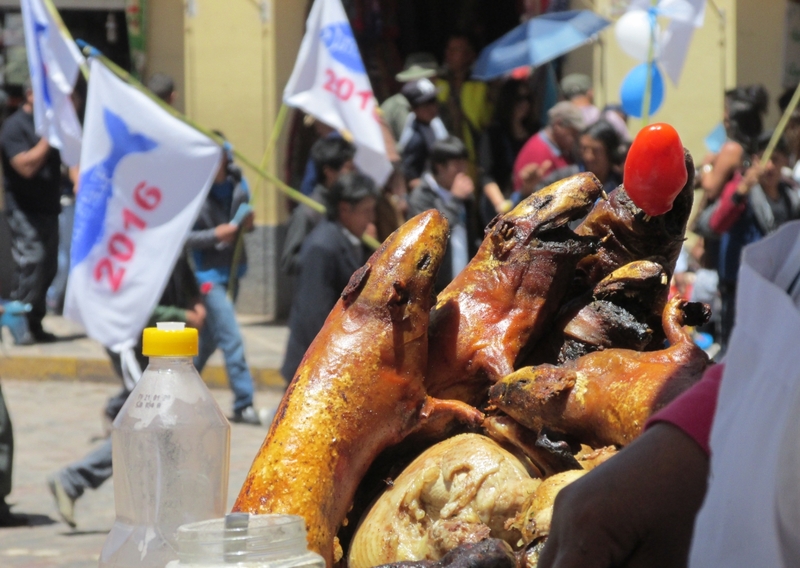 I’m sure I’m forgetting — or have yet to come across — many other strange foods in Peru. 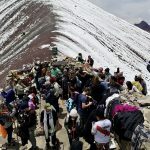 So if you’ve eaten something in Peru you’d consider strange, bizarre or otherwise notable, please share it with us in the comments section below. Thanks! Cow hoof broth, with the hoof in your soup bowl. I’ve seen it in Rioja. Also endangered turtle eggs, Obviously illegal. I was once in a taxi from Yurimaguas to Tarapoto, my fellow passengers told the driver their 5-gallon bucket contained fish. But the gendarmes just after the tunnel found out they were turtle eggs. A bribe was paid and we went on. Hi Susan. I’ve seen pig trotters being served in Peru, which are also fairly common in other countries (including in the UK), but I don’t think I’ve seen cow hoof. That’s a big hoof! So the turtle eggs were for eating? I saw live turtles for sale in Yurimaguas market; the woman told me they were sold as pets, but then admitted that people buy them for soup. But I’ve never actually seen turtle soup in Peru. We used to have lunch in local “Menú” restaurants. One we tried on the ring road was pure workmen clientele and the walls had A4 sheets each naming a different item. Three of these offered Caldo de Naríz, Caldo de Pata and Caldo de Cabeza. Although we are not in the Sierra these items are Sierra cuisine. Nothing is wasted up there and if you spend a few weeks e.g. at Fiesta time you’ll understand why. Guinea Pigs are frequently reared at home and may be slaughtered for fiesta time or for the occasional family (aunties uncles nephews and nieces size) get-together. Four quarters will serve four diners with treat extras of head or liver+kidneys+lungs. I have even seen sausages made with the intestines. This might sound labour-intensive but very often some of the “guests” arrive early and “volunteer” to help with the preparation. If cooked properly the skin is crispy like pork but finer and there are sweet bits of fat. Guinea pig is eaten by hand and, surprisingly to us, fried fish ditto. Guinea pigs fight a lot!